The Knopf Books cover for Red Spikes. Coming your way October 9. Jonathan Strahan's Year's Best, with my 'terrifying' story, 'Under Hell, Over Heaven', as well as a lot of PW-starrable material. And check out the King and Queen in the first row of contributors. It's just one happy thing after another, this week. for Sean Wallace (and possibly John Gregory Betancourt co-editing). Coolness! says the School Library Journal. Last week's class please note: This is what can happen to your Clarion stories. Plus, Markus, Sonya, Steven and Victor Kelleher are on the list. We're taking over the world in YA, people. 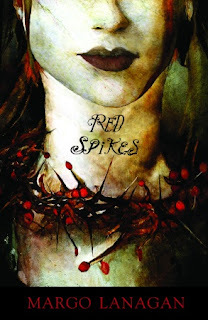 You can now purchase (for US$12.55) an e-book of Red Spikes. Breathless post as I plough through all the things I put off until first-week-back: Red Spikes has been shortlisted in the South East Asia and South Pacific section of the Commonwealth Writers' Prize! This is all eisha's fault for crowning me Queen of the Australian YA Renaissance. If you happen to be me..
...it's very nice to read a blog post called Margo Lanagan Rocks My World. Maybe I should get buttons made. Now I'm back in Brisbane, where the air is just as warm as in Kolkata, but not anything like as whiffy, and the roads belong to all these swish shiny cars that stay in their lanes - not a cow or a dusty bicycle or a trishaw to be seen. It is so quiet - not a car-horn to be heard! - and I have views of gumtrees, and more space, fresh air and natural light than I know what to do with. I've read the stories for Monday's workshop, and now it's time to shower, shop and do some background reading. 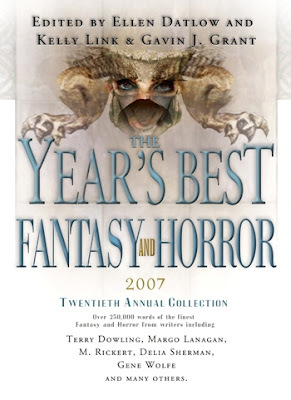 ...is here, and 'A Fine Magic' (from the Eidolon I anthology), and 'Under Hell, Over Heaven' and 'Winkie' from Red Spikes are listed in the short story category, and Red Spikes in the collection category. 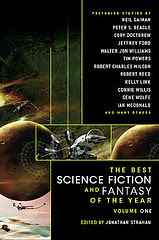 Eidolon I is also listed among the anthologies. Brought to you at sparrow-fart from Changi airport. Only three hours to wait until the plane leaves for Brisbane.